Mount Kelut (Kelud) volcano in Java, Indonesia erupted late on the 13th February 2014. The ash fall has been significant and widespread and has led to the closure of three major airports: Surabaya, Solo and Yogyakarta and the cancellation of many flights in the region. The image above shows ash covering an aircraft at Yogyakarta airport, which is 200 km to the west of the volcano (image source: AFP). A number of satellite instruments have been able to detect the ash and sulfur dioxide produced by the eruption. 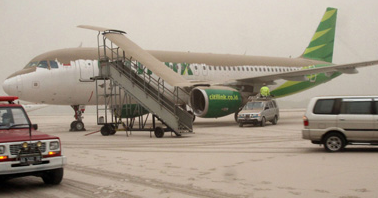 Volcanic ash is extremely dangerous to aircraft engines, so it is important that we are able to confidently map the location of the volcanic cloud. The map below shows just how many airports there are in the region showing just how much of an impact a volcanic eruption like this can have. Map of airports around Kelut Volcano (shown as yellow triangle). Airport locations from openflights.org. 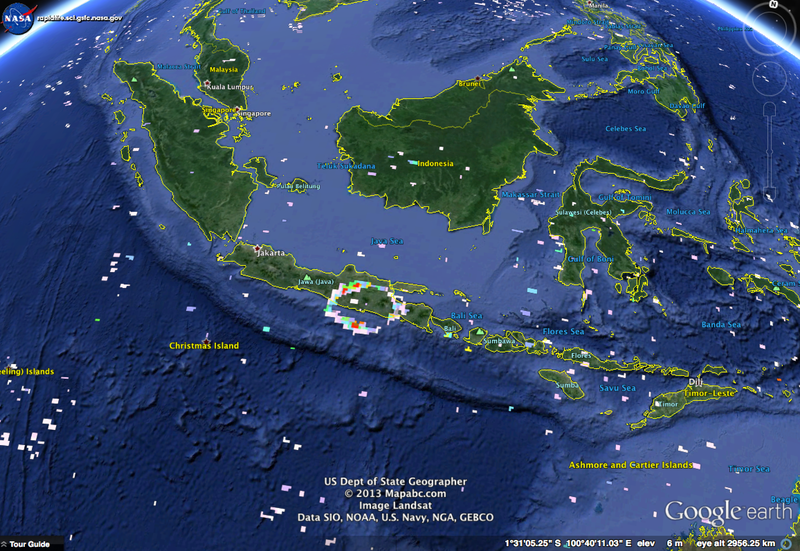 The AIRS instrument, on NASA’s Aqua satellite has detected the SO2 cloud from the explosion. 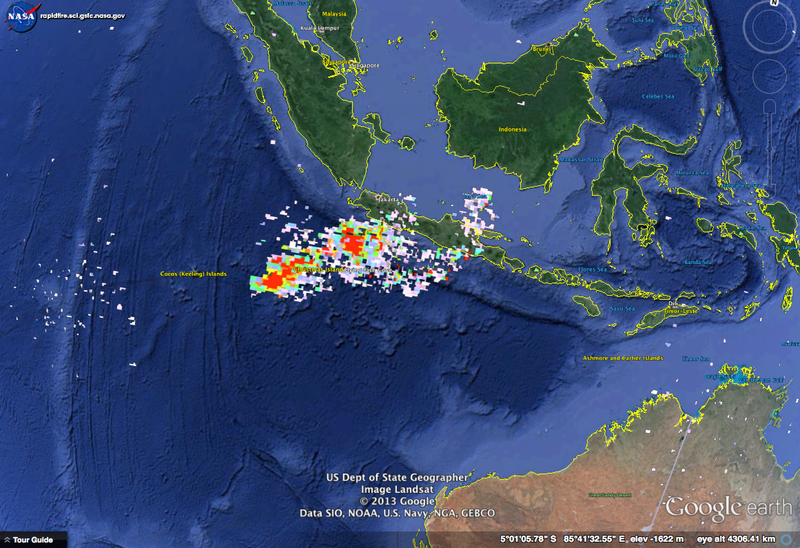 The following two images show the development of the cloud from the start of the eruption (18:10 UTC) to the next day when it has been transported to the west of Java (06:25 UTC). Another satellite sensor, GOME-2 which is on the ESA MetOp satellite uses ultraviolet radiation to detect SO2. 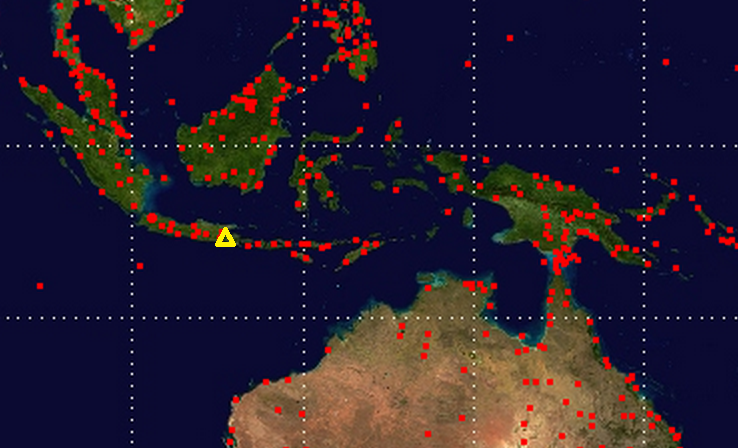 The MODIS instrument on the NASA Aqua platform is an infrared sensor which is sensitive to the presence of volcanic ash. 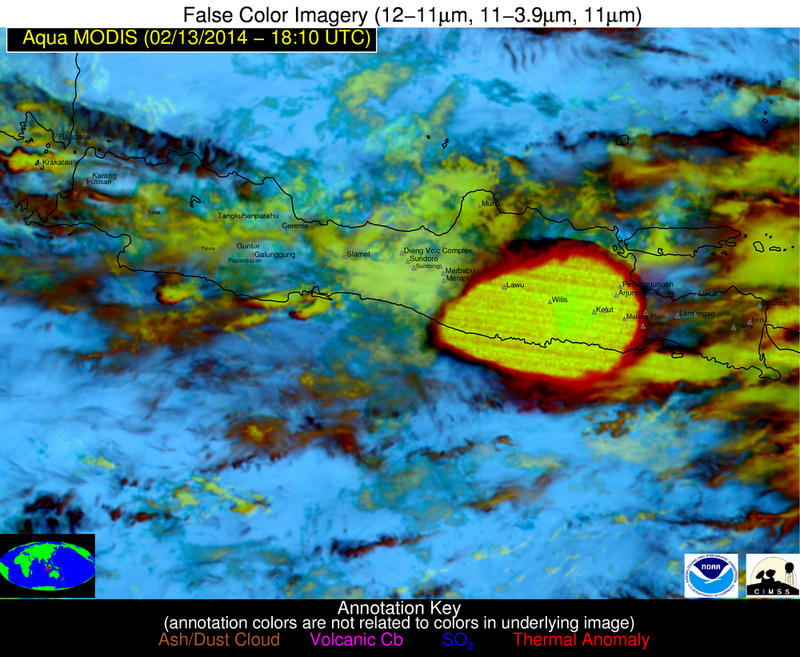 The false colour image below captured at 18:10 UTC, just after the eruption onset. The yellow circle, ringed by red, is the ash cloud which quickly rose high into the atmosphere and indicates just how large the original explosion was.